As an ops manager on Bid Ops Contractor Outreach automation product, I see how thousands of vendors respond when being invited to participate in a bid solicitation opportunity. There are certain qualities in a vendor's internet presence that are leading indicators for a successful on-time response. This guide is intended to summarize these leading indicators as tips for vendors who want to make sure they are maximizing their opportunity for growth. 1. Make sure that your inbox can receive e-mail. This is what a procurement organization receives back when a vendor's mailbox is too full to receive an invitation to a bid. Frankly, this tip should be pretty low-hanging fruit for any vendor who does a substantial amount of business commerce via email. However, this is not an isolated incident and is surely worth noting as a worthwhile part of every business development team checklist. 2. Put a valid sales email address on your company website. This is a simple sales hack that can dramatically improve your ability to participate in bids. Since many outreach automation tools, including Bid Ops Contractor Outreach, depend upon both public and private sources of digitally available business contact data, the mere presence of an email address on your website dramatically increases the likelihood that you'll receive relevant invitations to bid. Plain text on your company website is best, no need to worry about a hyperlink. However, if your sales organization is divided by products, geographic region or other criteria, please clearly label the appropriate point of contact. You may have thought: we don't want to list our email because we do not wish to receive spam emails. Truly, spam is annoying, but most modern email clients will give you the ability to block addresses by labeling them "Spam" after you have confirmed that they aren't a relevant business opportunity. The cost of missing out on business by having a firewall against "Unknown Contacts" likely outweighs the cost of deleting unwanted email, particularly for a multi-year, multi-million dollar contract. Some vendors have tried to solve this problem by having a Webform, where people can put in their info and then get contacted later ("don't call us, we'll call you"). Webforms are fine if you need a way for customers to sign up for a product demo, but they are absolutely terrible if someone is trying to reach you regarding a time-sensitive bid opportunity. Particularly if the back-end of that Webform is not well-monitored, you have just bought yourself a one-way ticket to Missing Out. 3. Have a defined process for routing time-sensitive business email. For Bid Ops Contractor Outreach, our process involves a two touch-point drip spaced several days apart to ensure that the message has gotten through without blowing up anyone's inbox with undesired content. 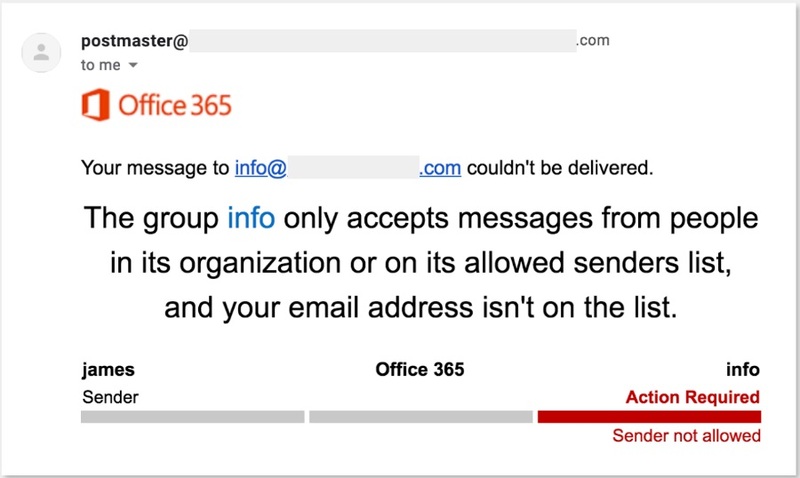 Unfortunately, some organizations have weak internal communication processes for routing emails. In one case, internal forwarding of email took five weeks before the correct information reached the person who was able to submit a bid response. Five weeks. Think about that. The reason that this matters is that bids can be complicated. They can require time to think, research, confirm details with engineers and subcontractors. If it takes five weeks for the documents to reach the correct person, then what impact does that have on their ability to prepare an adequate, thorough and thoughtful response? Delays eat up a ton of unnecessary bandwidth and ultimately lead to sales teams who must hustle or work overtime to complete the responses on time (or else miss out on the opportunity). This isn't a great outcome for anyone. If you're looking for a quick win here, make sure that you have a designated "bids" email address contact and put that email address in every sales team member's 'Out of Office' (OOO) auto-response. Your customers will thank you, and you may experience a measurable increase in the lead time to respond to contracting opportunities. While there are several variables involved with successful bidding, these three steps make a considerable difference ensuring your company properly prepares itself for success. If you are interested in trying Bid Ops Contractor Outreach risk-free for 30 days, please contact james@bid-ops.com for additional information.